Most Yesterland articles are about the past. This one is about the future, but the story begins exactly one year ago. On October 3, 2007, The Walt Disney Company announced plans to build an 800-unit resort on a prime 21-acre oceanfront site in Hawai‘i, with the opening scheduled for 2011. Borrowing a page from Disneys BoardWalk Villas in Florida, the Hawaiian resort would include Disney Vacation Club timeshare villas and regular deluxe hotel rooms. The press release included quotations from Disney Parks & Resorts Chairman Jay Rasulo and Hawai‘i Governor Linda Lingle, as well as praise for the master-planned Ko Olina development on the island of O‘ahu—but it said very little about the Disney resort itself. The press release included a single rendering, which is at the top of this article. 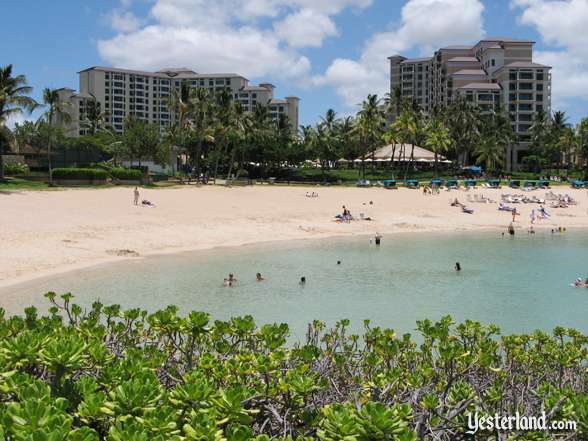 Luxury family resort planned for Ko Olina Resort & Marina on the island of O‘ahu. BURBANK, Calif., October 3, 2007 - Walt Disney Parks & Resorts has announced that the company has finalized plans to purchase 21 acres of oceanfront property on Hawai‘i’s island of O‘ahu. Consistently ranked as one of the top family destinations in the world, Hawai‘i’s natural beauty and extensive offering of family activities make it an ideal location for a Disney resort. The new resort hotel will be the latest addition to the Ko Olina development, known for its sweeping ocean views, picture-postcard white sand beaches and tranquil crystal blue lagoons. Jeff Stone, President of The Resort Group and master developer of Ko Olina, has been working closely with Disney on the land acquisition and project. *This resort is not yet registered or offered for sale. It was big news in Hawai‘i. Honolulu newspapers and television stations reported that Disney had paid $144 million for the 21-acre site—thats almost $7 million per acre. Groundbreaking would be in 2008. The best clues about the Disney resorts theme come from the rendering. The resort looks the way we mainlanders expect a Hawaiian resort to look, with thatch-roofed huts in the tradition of Polynesian villages. Even the high-rise section echoes the Polynesian look. 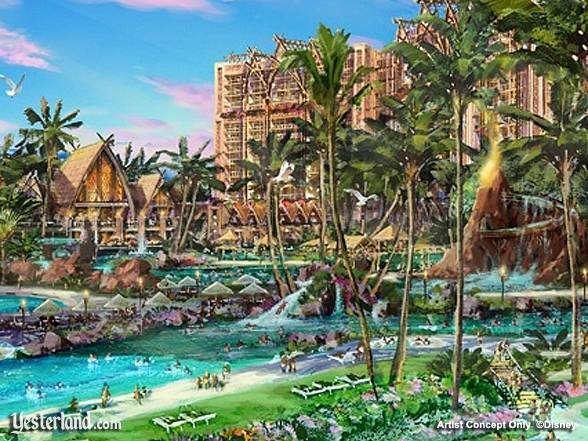 A volcano-themed waterslide and a series of tropical lagoons suggest a pool area that could rival Stormalong Bay at Disneys Yacht and Beach Clubs, but with an idealized Hawaiian setting. 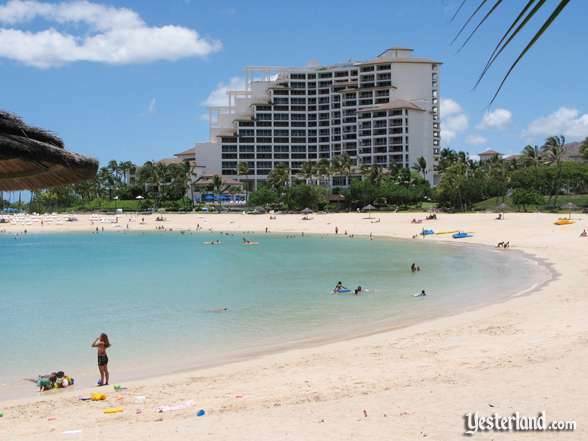 The JW Marriott Ihilani will be Disneys neighbor on Ko Olina Lagoon 1. 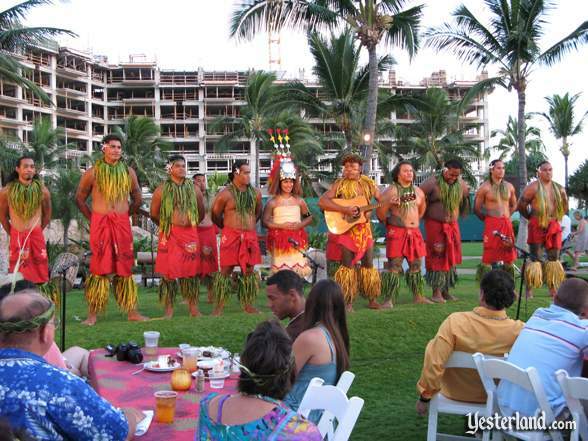 A Polynesian or Hawaiian theme may not seem particularly unusual for a resort in Hawai‘i. But, surprisingly, its a theme that other lodging companies avoid. It seems the Polynesian theme might be too closely associated the mainland tiki bars, “pu pu platter” eateries, and other Hawaiiana of the 1950s and 1960s. 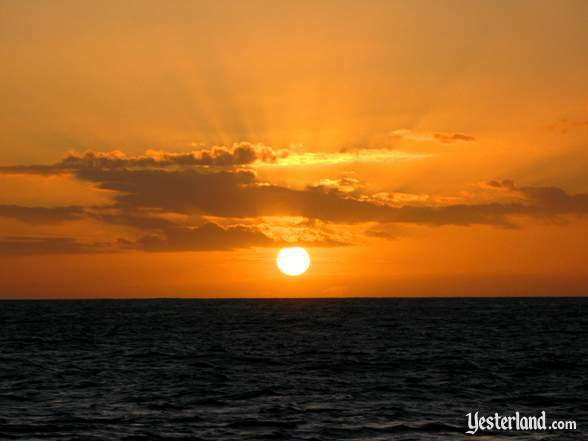 There are a few exceptions, such as the famed Kona Village on the Big Islands Kohala Coast. But most hotels in Hawai‘i avoid the thatched hut theme, opting instead for modern architecture or a look based on Hawai‘is Plantation period or even a Mediterranean style. Such hotels usually have an overlay of Hawaiian decor, with “tasteful” Hawaiian art and materials, especially in the lobby and guest rooms. And their landscaping features lush tropical plants (though often not native plants) and flaming torches at night, which make it clear youre not in Chicago. Future Curator of Yesterland with Coco Palms sink in 1987. It wasnt always like this. From the day it opened in 1953, the Coco Palms Resort on Kaua‘i immersed guests in an idealized ancient Hawai‘i, built around actual ancient royal fishponds. 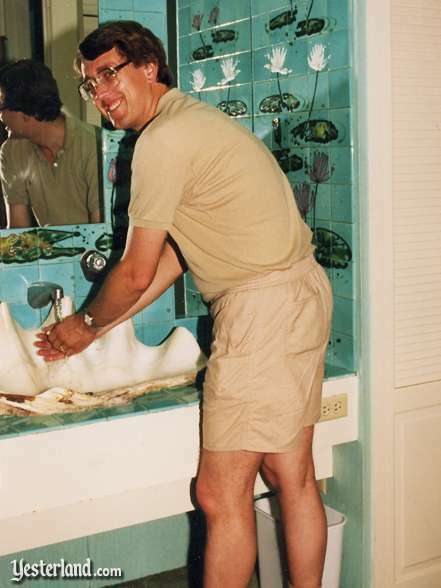 Under the leadership of visionary hotelier Grace Guslander, the Coco Palms Resort offered such features as giant South Pacific clam shells as bathroom sinks. Guslander invented the “traditional” torch lighting ceremony, which has been imitated throughout Hawai‘i. 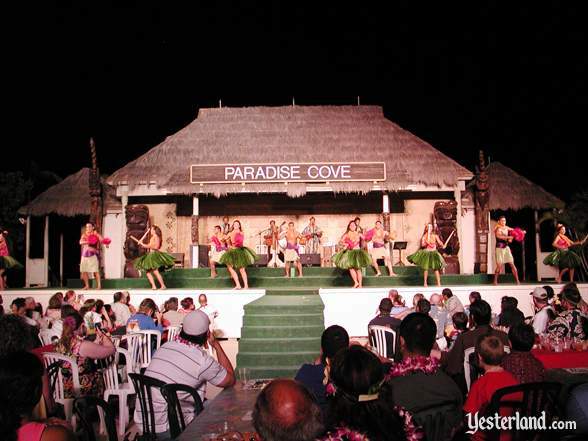 The Coco Palms Resort was the location for the highlights of Elvis Presleys 1961 film, Blue Hawaii. Alas, on September 11, 1992, Hurricane Iniki did so much damage to the venerable resort that it never reopened. It’s been said that Disney’s Wilderness Lodge is Yellowstone’s Old Faithful Inn on steroids, and Disney’s Grand Californian Resort is a Greene & Greene Craftsman bungalow on steroids. 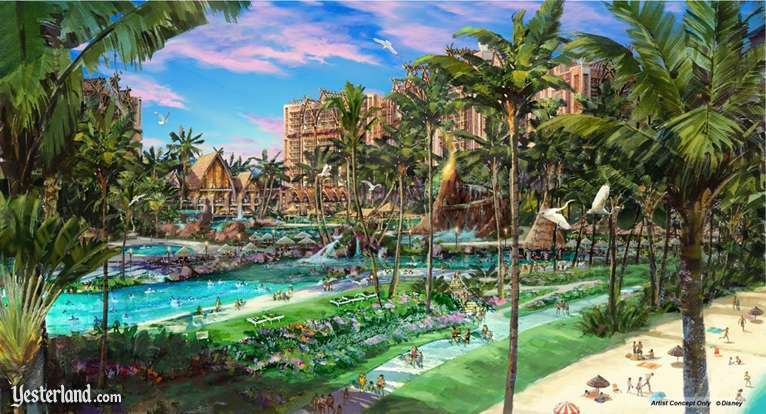 If the artist concept rendering is an accurate depiction of what Disney will build at Ko Olina, then this new resort will be the Coco Palms Resort on steroids. Enchanted Tiki Room art is not authentic—but sure is fun. 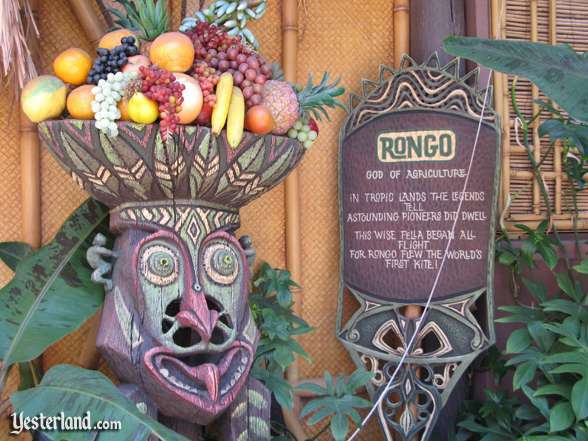 Actually, it would be great if Disney could have one restaurant that captures the cartoony mid-20th-century interpretation of Hawai‘i, as exemplified by the Enchanted Tiki Room. The hard part would be making sure that everyone understands what it is—a fun (and inoffensive) look at the Hawai‘i craze that swept the nation around the time of Hawai‘is 1959 statehood—not an assault on those who are seriously committed to preserving Hawai‘is rich but fragile culture. The first two buildings of Marriotts Ko Olina Beach Club. Most O‘ahu tourists book rooms on Waikiki. Most have probably never heard of the Ko Olina Resort & Marina, a master-planned, gated resort on the western shore of O‘ahu—essentially in the opposite direction from Honolulu International Airport as Waikiki. Paradise Cove is very touristy. Most guests are bused in from Waikiki. A seaside pedestrian pathway that goes from the JW Marriott Ihilani to the Marina, past all the manmade lagoons and the resorts that face them. Fia Fia at Marriotts Ko Olina Beach Club is a great show with surprisingly good food. The many attractions of O‘ahu await Ko Olina guests who want to leave the resort, but its possible to have a great vacation without leaving Ko Olina. Of course, the number one attraction is the beach. Disneys site faces directly toward Lagoon 1, the largest of the manmade lagoons. The water is calm because the lagoons are protected from the open ocean. The lagoons are like large, warm, salt-water swimming pools. Colorful tropical fish come into the lagoons, especially into Lagoon 1, so you can go snorkeling right from the beach. There are openings to the ocean to flush the lagoons continuously with clean ocean water. For safety, the openings are beyond roped-off sections of the lagoons. Speaking of safety, these lagoons are perfect family beaches, and are probably much safer than typical beaches that are subject to strong waves and ocean currents. However, its important not to be complacent. The day before my first visit to Ko Olina in 2005, a man drowned in Lagoon 1. 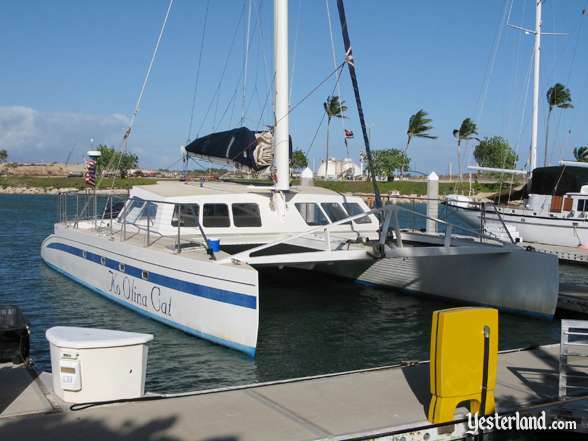 The Ko Olina Cat operates snorkeling cruises and sunset cruises out of the Ko Olina Marina. The activity desks at the two Marriott resorts sell a wide variety of tours and activities, and Disney will undoubtedly do the same. Im very fond of the Ko Olina Cat, especially the sunset sailings. Kapolei, O‘ahus “second city” offers contemporary conveniences. The resorts of Ko Olina are part of the fast-growing city of Kapolei. Before the Disney resort is completed, Kaoplei will gain a Target, a Costco, and two new shopping centers. It may seem strange to fly halfway across the Pacific Ocean to go to the same big box stores that are at home. But it will be convenient to have access to such stores when shopping for food to stock the villa kitchen or to pick up anything that didnt get packed in a suitcase. The Ko Olina Resort has only a few restaurants today. We can expect a few more from Disney. 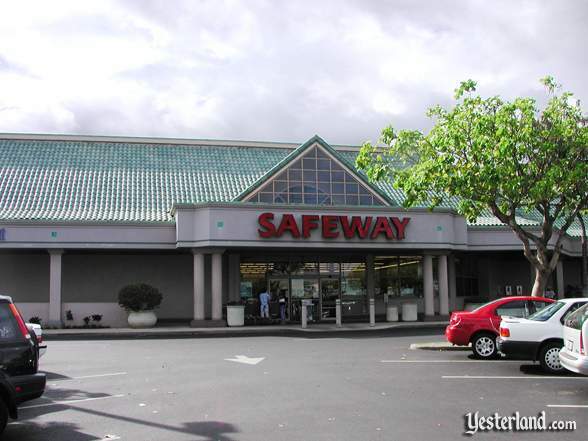 With the new shopping centers in Kapolei, there should be still more restaurants. It will be good to have additional choices. Ko Olina has spectacular sunsets. Yes, Disney picked a great location. All other photos: Werner Weiss, 2005-2007.